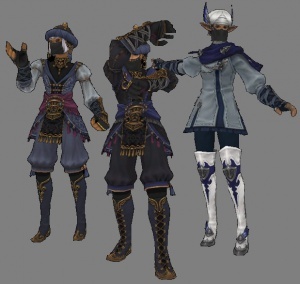 Unlike other jobs, Blue Mage must select which spells and job traits to go into battle with via the magic menu → set spells. There are limits to this based on the level of the Blue Mage as seen in the table to the left. Chain Affinity Recast Shorten recast time by 4 seconds. Burst Affinity Recast Shorten recast time by 4 seconds. Monster Correlation Increase monster family related effects by 1. Physical Potency Increase the potency of physical blue magic spells by 2. Magical Accuracy Increase the accuracy of magical blue magic spells by 2. Convergence Increases the power of your next magical blue magic spell. Limits area of effect to single target. Recast: 10min. Increase magic attack by 5 and magic accuracy by 5. Diffusion Grants the effect of your next support blue magic spell to party members within range. Recast: 10min. Increase duration by 5%. Enchainment Grants a TP bonus to Chain Affinity. Increase TP bonus by 100. Assimilation Increases maximum blue magic points. Increase blue magic point maximum by 1. This page was last edited on 16 April 2017, at 22:51.